Kpreps Friday First Look provides our initial reaction to some most notable games and performances in the state from Week 2. This one is going to spark some discussion. Manhattan survived Topeka High 21-20 in overtime on Friday as Trojan junior back Ky Thomas was ruled down short of the goal line as he dived for what would have been the game-winning two-point conversion. Video replay and photos seem to indicate that Topeka High coach Walt Alexander’s game and Thomas’ scramble should have resulted in a Trojan victory. But as Thomas and the Trojans initially celebrated, the official ruled the two-point attempt no good and the home crowd at Bishop Stadium erupted. Topeka lead for much of the night and seemed poised to put the game away while threatening to extend its 14-6 lead in the fourth quarter. But Manhattan intercepted Trojan quarterback Da’Vonshai Harden and the Indian offense drove the field knotting the game on a Kevontae McDonald touchdown run and Isiah Childs two-point attempt. In overtime, Childs put Manhattan on the board with a 10-yard run. Topeka answered as Harden connected with Thomas on a 7-yard score setting up the controversial two-point attempt. Thomas led the Trojans with 96 yards rushing, while McDonald led Manhattan with a game-high 195 yards. Blue Valley outscored Blue Valley North 25-6 in the second half to win the battle of Eastern Kansas League teams searching for their first win. Blue Valley North led 14-3 in the second quarter as Graham Mertz connected on first-half touchdown passes to Cameron Burt and Amauri Pesek-Hickson. Blue Valley added a field goal before halftime to close the gap to 14-6. The Tiger offense then took over in the third quarter as Eric Olson rushed for a pair of touchdowns to put Blue Valley on top, 18-14. Walker Kinney then tossed a long touchdown pass to Nash Sloan to extend the Tiger lead to 25-14. Mertz would respond with another strike to Burt to pull the Mustangs within 25-20, but Kinney would hit Matt Kennedy on a short throw-and-catch in the fourth quarter to give the Tigers a 31-20 lead. Kinney passed for 276 yards and two scores, while Olson added 170 rush yards and two scores for the Tigers. Mertz completed 19 of 39 passes for 290 yards and three touchdowns. Washburn Rural struck for 27 second-half points to overtake Junction City, 34-24. The Junior Blue seemingly had an answer every time Junction City took the lead, partially the result of six Blue Jay turnovers in the game. Jaylen Carter’s 5-yard touchdown midway through the third quarter tied the game at 21. Junction City regained the lead on a field goal by Jaden Kell to lead 24-21 heading into the fourth quarter. That’s when Washburn Rural took control. Carter scored from 35 yards out to give the Junior Blues a 28-24 lead. Later, Jordan White converted a 4-and-1 into a 14-yard touchdown run and a 34-24 lead. Carter and White both eclipsed the 100-yard mark on the ground. Carter led the Junior Blues with 143 yards and two scores, while White added 106 yards and two scores. How about the Wichita North Redskins? After ending a 21-game losing streak last week with a 29-22 victory over Wichita South, North went on the road and knocked off the Liberal Redskins, 13-6. North led 7-0 for most of the game before adding a late score to take a 13-0 lead. A late touchdown pulled Liberal within the final one-score margin. North, which hadn’t won two games in a season since 2009, will not go for a third win next week against Wichita Southeast. The Redskins’ last three-win season came in 2004. Shawnee Mission South defeated rival Shawnee Mission West, 27-6. The Vikings, which also call Shawnee Mission South Stadium their home, opened the scoring late in the first quarter to take a 6-0 lead. SM South would then tie the game at six at halftime. The Raiders would add another touchdown in the third quarter and two more scores in the game’s final four minutes to seal the victory. The win marks the first time the Raiders have won consecutive games since the 2013 season. Bishop Carroll led throughout in bouncing back from the Week 1 loss to Wichtia Northwest with a 36-20 victory over Wichita Heights. Jackson Nichols rushed for a pair of touchdowns in the first half as the Golden Eagles led 15-7. The lead was extended to 22-7 on a Cade Becker touchdown pass to Clay Cundiff. But Heights would get that score right back as K’Vonte Baker returned the ensuing kickoff 90 yards for a touchdown. Nicholls then broke a 60-yard score early in the fourth quarter followed by a Becker touchdown run to push the Carroll lead to 36-14. Baker would add a late touchdown to pull Heights within the final margin of 36-20. 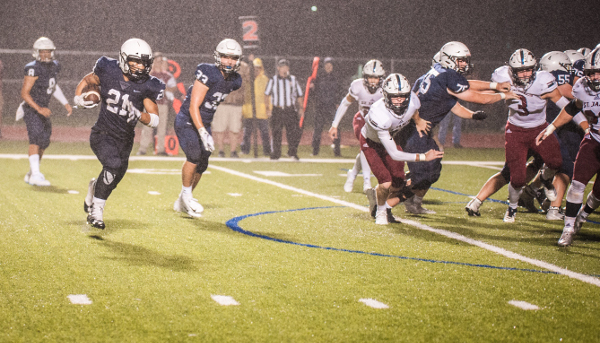 Mill Valley rallied for two fourth-quarter touchdowns to beat St. James Academy, 14-13. Jordan Preston’s touchdown pass to Jayce Zukowski with 90 seconds remaining provided the winning points for the Jaguars. St. James led 13-0 heading to the fourth quarter. Both Thunder scores came on Jack Moellers’ passes to J.J. Tylicki and Michael Tujague. Mill Valley pulled to within 13-7 on a Tyler Green short scoring run. Green finished with nearly 150 yards on the ground for Mill Valley, while Preston passed for 300 yards. Moellers passed for 234 yards and those two scores, but the Thunder could manage only 65 rushing yards on 25 attempts. Topeka Seaman turned away rival Topeka Hayden time and time again in securing its third straight win in the series with a 13-0 shutout. Hayden reached Viking territory several times but could not convert the drives into points. Seaman got on the scoreboard on a long touchdown pass from back-up quarterback Brayden Vawter to starting quarterback Kobe Jones to take a 7-0 lead. The Vikings then added a pair of Brock Hillebert field goals in the second half to seal the victory. Fifth-ranked Maize continues to impress after the Eagles blasted Hutchinson, 49-0. Quarterback Caleb Grill passed for 205 yards and threw four touchdowns passes while adding another rushing score. Caden Cox also chipped in 110 yards on the ground and two more Eagle touchdowns. Maize has won both of its games this season by the same 49-0 score, while Hutchinson has been outscored 104-14. After a missed PAT resulted in a heart-breaking 21-20 overtime loss to Hays a season ago, the Great Bend Panthers made enough plays on Friday night to beat the Indians, 15-7. Hays led 7-6 at halftime after a Palmer Hutchinson touchdown pass to Mason Ibarra. The Indians remained in the lead by a single point for much of the third quarter, leaving Great Bend chasing another missed PAT. But late in the third quarter, Dalton Miller hauled in a 45-yard touchdown pass to put the Panthers in front, 12-7. Great Bend would add a field goal in the fourth quarter and hold on for the eight-point victory. Paola dominated Fort Scott on Friday night, winning 42-0. The Panthers rushed for more than 230 yards and used four different ball carriers to play keep away from the Fort Scott defense. Quarterback Seth Richmond rushed for a pair of touchdowns and returned an interception for a score to cap the scoring for Paola. In a series where three of the past four meeting have been decided by six points or less (and two meetings by one point), the Panthers built a 28-0 lead. Paola has now outscored its two opponents this season 83-0. Third-ranked Scott City scored three touchdowns in the first quarter in picking up an impressive 24-0 win at Holcomb. Wyatt Hayes rushed for 165 yards and a pair of touchdowns in the win. The story of the game may have been the Beaver defense which held Holcomb to under 50 yards of total offense. Perry-Lecompton made a statement on Friday night with a 46-0 blanking of Holton. We expected the Kaws to be a contender this season in Class 3A, and they have supported that prediction by posting consecutive shutouts and scoring 114 points in two games. Dalton Kellum had another huge night in rushing for 230 yards and two touchdowns. The Kaw have huge Big 7 Conference showdown in Week 3 when they travel to take on No. 2 Sabetha. The fourth-ranked Pratt Greenbacks moved to 2-0 with a 32-16 victory over Central Kansas League rival Halstead. Travis Theis opened the scoring in the first quarter with a 91-yard touchdown run to give Pratt a 6-0 lead. Hunter Huber’s two-yard run extended the Greenback lead to 12-0. Halstead got on the board in the second quarter on a long touchdown run by Bryant Odendahl. But Pratt would immediately respond with another Theis touchdown run to extend the lead to 19-8 at halftime. Caden Blankenship broke free for a 20-yard score in the third quarter to put the Greenbacks up 25-8. Halstead would pull to within 25-16 late in the third quarter before Pratt added another Theis score late in the fourth quarter. Silver Lake survived a fourth-quarter rally by Rossville to win the “War on 24”, 17-14. The Eagles led 7-0 at halftime and 10-0 in the third quarter on the strength of a Christian Stoner touchdown run and a Logan Matzke field goal. Rossville would respond shortly after as Garrett Carver broke a long touchdown run to pull the Bulldawgs within 10-7. Silver Lake retained that slim three-point lead until early in the fourth quarter when quarterback Mason Griffin hit Tristan Stoner on a short touchdown pass to put the Eagles up 17-7. But Rossville would again respond. Carver hit Teagan Sumner on an 18-yard touchdown pass to close the gap within 17-14. Rossville then recovered a Silver Lake fumble on the very next possession setting the Bulldawg offense up inside Eagle territory. Rossville drove inside the Silver Lake 15-yard line before missing on a 30-yard field goal. Christian Stoner led Silver Lake with 166 yards rushing and a touchdown, while Griffin passed for 168 yards and the other score. Riley County and Centralia traded touchdowns in the final five minutes with the Falcons coming out on top, 26-21. Riley County extended its 12-7 halftime lead to 18-7 with touchdown pass from Garrett Harmison to Westyn Claar. Centralia would respond, however, as Isaac Gore scored from three yards out to pull the Panthers within 18-15 mid-way through the fourth quarter. A few minutes later, Gore broke a 35-yard touchdown run that put Centralia up 21-18 with under five minutes to play. Riley County would answer with 2:30 remaining, however, as Mikey Waggoner hauled in a 39-yards touchdown pass from Harmison for the winning points. Waggoner led the Falcons with 185 yards rushing and two scores on 22 carries. Waggoner also caught three passes for 46 yards and a score. Harmison passed for 200 yards and two touchdowns on the night. Riley County moves to 2-0 and will travel to Mid-East League rival Silver Lake next week. Top-ranked Phillipsburg scored 24 points over the second and third quarters to pull away from Plainville, 31-3. The Panthers scored a touchdown and a field goal in the final six minutes of the second quarter to take a 17-3 advantage into halftime. Phillipsburg scored twice in the third quarter and the rode a strong defensive effort to the victory. The Panther defense held Plainville to 145 yards of total offense in the game. Colgan scored twice in the second quarter in shutting out rival Frontenac for a second straight season. While the wet and muddy field conditions certainly dictated the style of play, the Panthers were content in keep the ball on the ground and grinding out more than 300 rushing yards for a second consecutive week. The Panthers got the scoring started mid-way through the second quarter when Kash Marietta sprinted 39 yards for a score and a 7-0 lead. Frontenac threatened late in the first half reaching the Panther 9-yard line, but Frontenac quarterback Jake Beckmann’s fourth-down pass was intercepted in the end zone by Colgan’s Cal Marquardt. The Panthers seemed satisfied with running out the clock, but quarterback Cade Simmons broke free for an 81-yard touchdown run to push the Panther lead to 14-0 with 19 seconds remaining until halftime. Colgan kept the ball on the ground, played solid defense, and field position in the second half. Simmons led the Panthers with 147 rushing yards on 15 attempts, while Matthew Lomshek added 88 yards on the ground. Colgan rushed for 305 and attempted only one pass which fell incomplete. Defending 8M-I champion Hoxie slowed down Osborne’s high-powered offense in defeating the Bulldogs, 52-20. Hoxie led Osborne, ranked No. 2 in 8M-II, 28-14 at halftime before the Bulldogs tightened the gap to within 28-20 in the third quarter. Hoxie then scored the game’s final 24 points to provide separation. Wylie Weems rushed for 150 yards and three scores, while Jared Kennedy passed for more than 100 yards and two touchdowns. Osborne’s Darnell Holloway was held to 18 rushing yards on eight attempts after rushing for 356 yards last week. Keyed on in the run game, Holloway passed for more than 100 yards and two scores. Central Plains scored in each quarter and used a strong defensive effort to defeat No. 3 Victoria, 32-8. Myles Menges rushed for a touchdown and threw a touchdown pass to Jerred Bieberle as the Oilers built a 12-0 halftime lead. Menges then hit Lawson Oeser on a 36-yard touchdown pass in the third quarter, and Alex Hickel rushed for two scores to put the game out of reach. Central Plains held Victoria to 124 yards of total offense in the game. Hodgeman County went on the road and defeated new 8-Man member Medicine Lodge, 36-24. The Longhorns built a 22-6 halftime lead then scored on the opening drive of the second half to take a 28-6 lead. Medicine Lodge would add a pair of touchdowns to pull within 28-18 in the third quarter. Needing a defensive stand, Medicine Lodge recovered Longhorn fumble in the end zone for a touchback. Shortly after, the Indians scored on a touchdown pass from Garrett Burden to Dakota Bayliff to cut Hodgeman County’s lead to 28-24. The Longhorns would respond with a long, time-consuming drive resulting in a touchdown that would put the final margin at 36-24. South Central scored a pair of fourth-quarter touchdowns to pull away from Spearville, 24-8, in a high-level matchup between two projected playoff teams. The T-Wolves were led by quarterback Chayde Snyder’s 174 yards and three rushing touchdowns. Snyder also passed for 46 yards including a 13-yard strike to Jonny Robles in the fourth quarter that extended the South Central lead to 18-8. South Central’s defense held Spearville to 110 yards of total offense on 59 plays and forced a pair of turnovers. Congratulations to the Kinsley Coyotes for snapping a 22-game losing streak with a 36-24 victory over St. John on Friday night. The Coyotes led 24-12 at halftime with each team adding a pair of touchdowns in the second half. Kinsley’s last victory came on October 9, 2015 when the Coyotes defeated Macksville, 60-32. Pawnee Heights extended its win streak to 11 games with a 39-37 victory over Weskan. The Tigers led 20-0 early before Weskan scored two consecutive touchdowns to get within 20-12. Another Tiger touchdown pushed the lead to 26-12 before Weskan pulled to within 26-19 at halftime. The Coyotes got as close as 26-25 in the third quarter before Pawnee Heights answered. The lead never reached double digits again in the second half. Pawnee Heights (2017) and Weksan (2016) are the first two winners of the Wild West Bowl – the 6-Man State Championship.